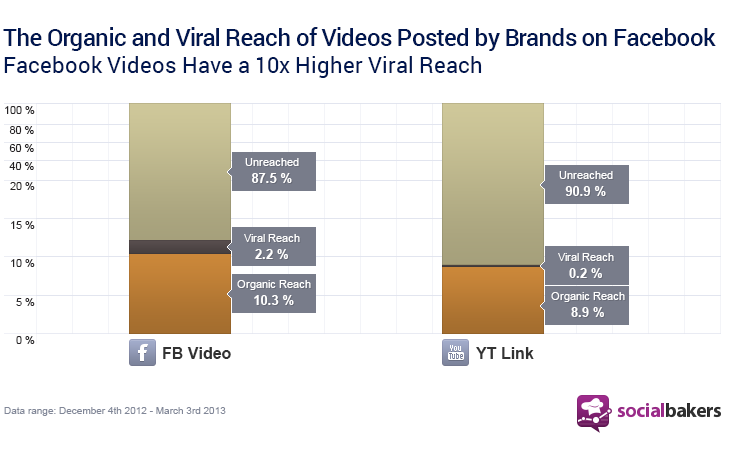 People tend to “Like” videos on Facebook more than they actually watch them. According to ReelSeo.com, user-initiated playbacks for Facebook are around 1%, which is much lower than YouTube. 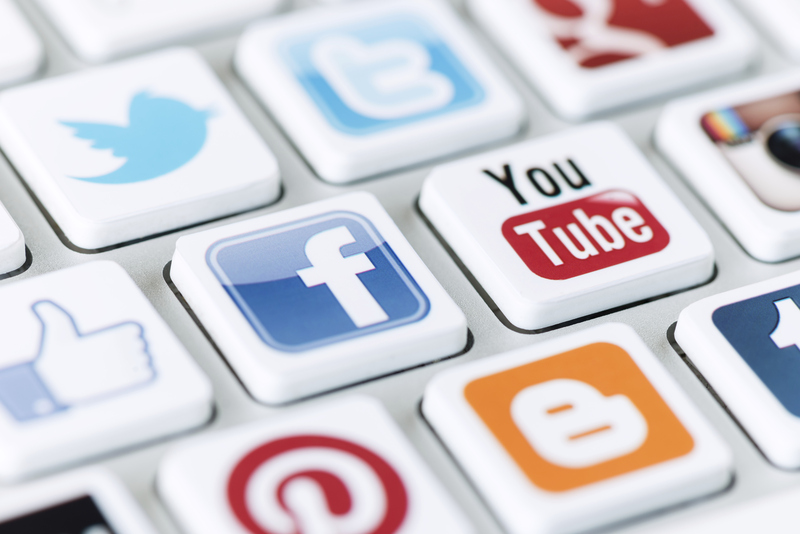 For overall brand awareness, it is a good idea to take advantage of Facebook’s autoplay. Facebook videos are easier to consume on mobile, which is now the primary way of visiting Facebook. With posted links, you are brought to another page (either YouTube, or another hosting site). A Facebook video will also include a “Like” button to direct people to your business page. The video to the left shows a Facebook direct upload, while the video to the right shows a YouTube link. Aside from the preferential treatment in showing up on a person’s timeline (detailed below), Facebook gives the direct posted video better real estate and visibility on a timeline. 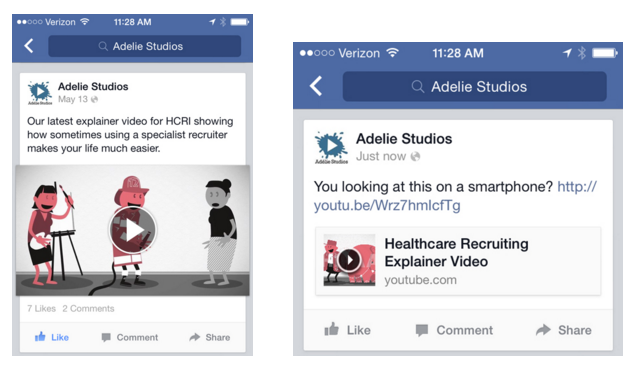 Facebook give prominence to posts with videos uploaded directly to Facebook. After Facebook-native video, Facebook gives secondary importance to posts with images uploaded directly to Facebook. At the lowest priority, Facebook prioritizes posts with a YouTube link. If you’re trying to drive traffic to your website via Facebook, a good sidestep is to direct post an image of your video with a play button graphic which actually links to your website. This causes Facebook to give the post preferential treatment as you’re direct posting an image, and not a link. Take a large-sized image snapshot/screengrab of the video that is catchy or matches the video’s thumbnail. Or with a little more effort you can make a short video teaser snippet of your full-length video. The first thing you do to a new Facebook post is upload that image. Or upload the video teaser for better results. Take the YouTube URL for the video and “disguise” it through a URL shortener, like bitly.com. Bonus points for using Bitly for a short URL of a playlist that starts with that video, because you’ll increase watch time on your YouTube channel because your next video in the playlist will automatically start after the first one ends. Write the text in your Facebook post and paste in the shortened URL for the video or playlist. You have to upload the photo first so it registers as a photo. You can’t post the link first because Facebook will recognize it as a YouTube video, even though you’ve posted it as Bitly link. Facebook has started to recognize these “photos” with URLs and have said they will start suppressing them, however, if you’re after YouTube monetization, it’s still the best option of directing people to a YouTube video. For any method of posting a video, if you pay for promotion on Facebook, it gets the views up dramatically. Keep in mind, you don’t want all of your content available from only one source. With videos directly uploaded to Facebook, you are unable to share that video on other platforms (YouTube, Twitter). For the most successful reach of any video, it is best to upload it to multiple sites since Google and Facebook are in an arms race. Google will still favor a YouTube video in search results (especially if that video is properly tagged and closed captioning is turned on). So continue posting to YouTube to take advantage of the SEO benefits with your website and any monetization that may be occurring. One thing to note: Your post may be viewed more in Facebook if it is direct posted, but your video is more likely to be played in YouTube. That should be kept in mind when posting a video and what that message is. Thanks to SocialBackers for this great information. This entry was posted in Advertising, SEO, Social Media and tagged . Bookmark the permalink.